With the current emphasis on fiber and heart-healthy eating, whole-grain products such as brown rice are increasingly popular. Brown rice contains all three parts of the rice grain: the nutrient-rich germ center, the seed kernel called endosperm and the fiber-rich outer hull known as bran. 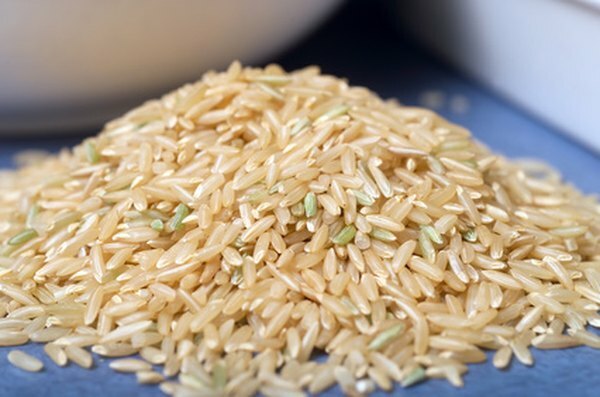 Free from forms of gluten that trigger gluten sensitivity or an autoimmune disorder known as celiac disease, brown rice provides solid nutrition for people on a gluten-free diet. The term “gluten” refers to a number of plant storage proteins. The gliadin gluten in wheat, hordein from barley and secalin from rye all trigger gluten sensitivity and an autoimmune disorder known as celiac disease. Brown rice contains a form of gluten known as oryzenin, which does not trigger these responses, according to the Celiac Sprue Association. If you have celiac disease and eat a forbidden form of gluten, the resulting autoimmune response damages the villi, or small fingerlike projections inside your small intestine. Over time, the villi become less efficient at absorbing vital nutrients and you may become malnourished. However, the oryzenin form of gluten in rice does not cause this reaction and your villi should remain healthy. Parents who want their children to eat a gluten-free diet for autism can also serve brown rice without triggering any problems. Brown rice has almost 1.8 grams of fiber and 2.3 grams of heart-healthy plant protein in a half-cup serving. It’s also loaded with a variety of minerals and vitamins, including folate and an array of B vitamins. The Linus Pauling Institute lists brown rice as a whole-grain foods, which means that it helps lower your cholesterol and reduces your risk factors for coronary heart disease. These nutritional qualities make brown rice a good choice for individuals on a gluten-free diet. While brown rice is naturally gluten-free, it can become contaminated with gluten during the manufacturing process. Read the nutrition facts label carefully when purchasing a new brand of brown rice, or contact the manufacturer directly to ensure the product is totally gluten-free. Once you bring the brown rice home, store it in a separate location from gluten-laden foods, including flours made from wheat, barley or rye. Some condiments used to season brown rice, such as soy sauce, may contain gluten, so it’s important to choose gluten-free brands.